Home Editorials One World Trade Centre open for terrorists? Recently, two separate incidents highlighted just how vulnerable the 1WTC is to terrorists. 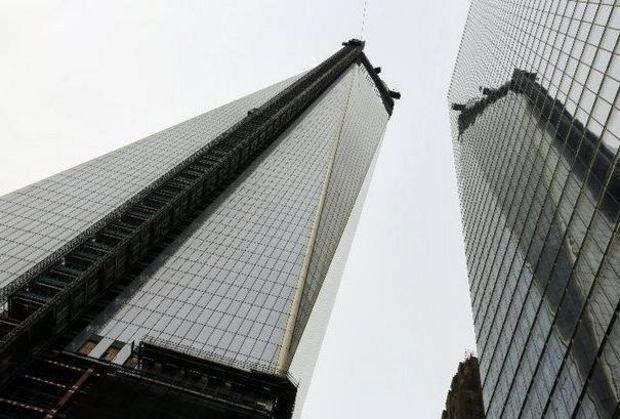 A teenager managed to evade security last week, which prompted TIME: The daring climb raises questions about the security of America’s tallest building. Noooooo kidding.. In September last year, there was the case of three skydiving from the WTC….They were arrested this week. Go and check out this report (with video) on USA Today. Now, the New York Post tells us that yes, there is a security system for this building ‘but it’s still sitting in its box in a back office because they didn’t want to pay extra for installation’……Really?????? Go read the rest on that. A “well-placed source” told the Post the $4,000 security system is still sitting in a back office because the Port Authority expressed frustration with paying extra for installation. A report from the Post found that there isn’t a single working security camera inside the building. “He (a Port Authority official) looked at me and my colleague and said, ‘Why did I spend $4,000 on this equipment when you could have gone to Home Depot and gotten something cheaper? '” the source told The Post. The source is a veteran electrician who worked on the project for the vendor, Angel Electronics, the report said. “I was kind of stunned, because that’s a pretty bold statement to make considering we got the specs from them, and the Port Authority had it made to order,” the source told the Post…. “Kind of stunned”??????? Yes, me too. Oh and about those terrorists that Obama refuses to admit still pose a threat to us here? A joint inquiry co-chaired by a former senator has warned that the American network that supported and trained the 9/11 hijackers was never fully dismantled, and that it remains a threat, pending the release of a secret report from the era. Former Senator. Bob Graham (D-Florida) points out that a 28-page section from the “Joint Inquiry into Intelligence Community Activities Before and After the Terrorist Attacks of September 11, 2001” was classified under President George W. Bush and remains so under President Barack Obama. A Clarion Project investigation has discovered a jihadist enclave in Texas where a deadly shooting took place in 2002. My long time readers know I am no rabid conspiracy theorist, BUT given the two recent incidents linked to above; given the documented proof of what is coming across US borders every day, and claims of “22 villages around the US,” it is beyond time for the current crop of politicians to get serious about the ever-present threat of terrorism in America. Anybody who pays any kind of attention to what is going on, has to know how deadly serious the terrorism threat remains – to all of us.. I am on the record as saying I believe there WILL be another terrorist attack within our borders. The two most recent incidents tell me that we have learned nothing from 9/11. If we choose to ignore such glaring lacks of security as detailed above, we WILL live (if we are lucky) to regret that we refused to pay a really ‘hefty’ price.